I was recently given a Dario Smartphone Glucose Meter and some test strips to try from my friends at Perth Diabetes Care. 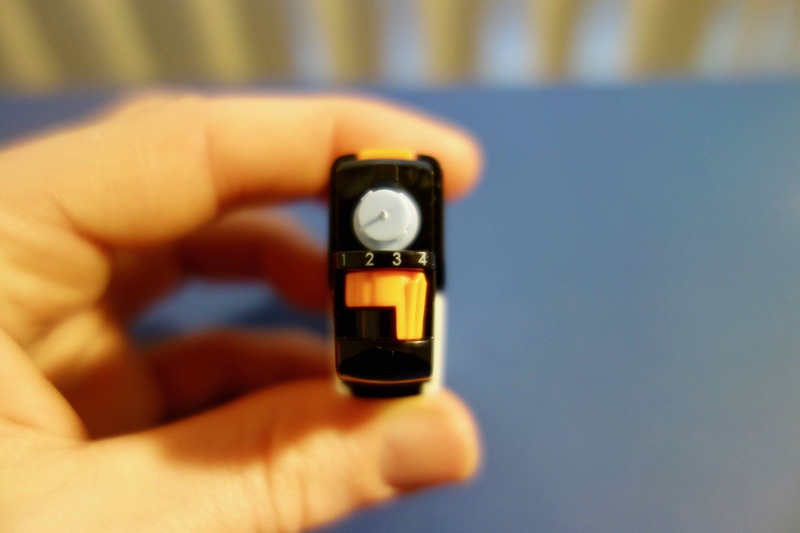 I squealed with excitement at the prospect of taking that little orange device home with me, because I tend to get pretty excited about integrating my diabetes tasks with my screentime. There was no expectation that I would blog about the Dario, and all opinions expressed here are my own. 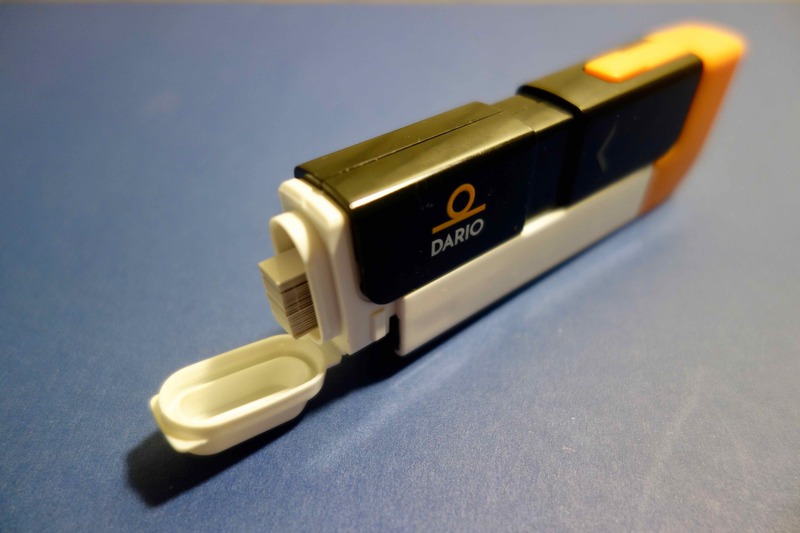 The Dario is a really nifty little device. I was surprised at Dario’s relatively low key launch into Australia, considering that many bloggers in the UK were given meters to try some time ago. If it weren’t for the odd sponsored post on Facebook or my perusing the Diabetes WA online shop, I wouldn’t have known it had hit our shores. So, it’s an all in one glucose meter. Lancing device at one end, test strip vials stored on the opposite end. For some crazy reason, I thought the whole device clipped onto the bottom of my smartphone. So there I was on the first night I brought it home, trying to attach the whole damn thing to my phone! Until I realised that only the little test strip port connects via the headphone jack. You also need to download the Dario app to your phone, and register to get started. I was able to register with my Facebook account, which is a big plus in my book – one less password to remember! 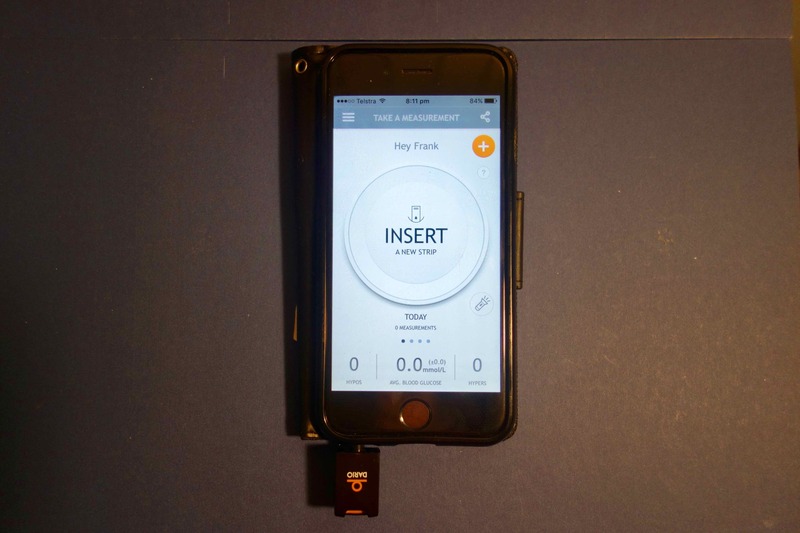 Once you’ve opened the app and connected the little test strip port, you can insert a strip and receive a glucose reading on your phone screen. The Dario app also had features like a bolus calculator, food databases, data sharing and an estimated hba1c. The data entry screen shown below gave me plenty of time after testing to input carbs and calculate an insulin dose, so long as I didn’t press the tick to exit. I didn’t really make too much use of the app because I use my insulin pump for calculations, but I imagine that if I were on injections this would be really useful. How accurate are the strips? Although I felt extremely wasteful doing unnecessary tests for the purposes of answering this question, the Dario quickly proved to me that it was a reliable competitor. It held up extremely well against my FreeStyle Libre, my FreeStyle Insulinx, high blood sugar levels and in target blood sugar levels. From memory, most of my comparisons were within 0.5mmol – with the exception of my One Touch Verio, which tends to read slightly higher than my other meters. I really wanted to like this device. Unfortunately I just found it really tiresome to have to pull out my phone, open the app, eject the test strip port from the Dario, connect it to my phone, pull out a test strip and prick my finger for a result. After a week I still felt kind of clunky using it. I couldn’t remember how to eject the little test strip port from the Dario, or which end was for lancing and which end was for test strips. Although I had a box of test strips to play with, I didn’t use it as much as I thought I would. While I was out and about, using my meter was simply more convenient. 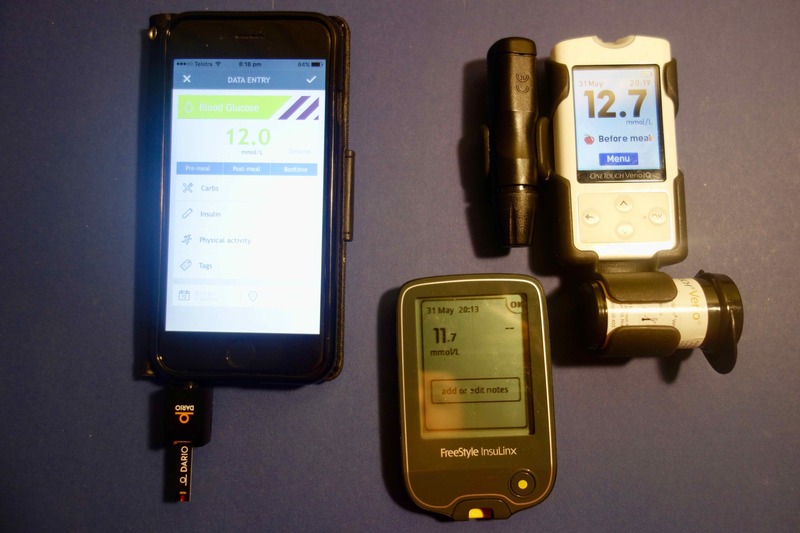 While I loved the idea of an all in one glucose meter, the reality is that I have to be prepared for my diabetes every time I leave the house. I already carry skittles, insulin and spare supplies to deal with a pump failure, that carrying a meter, test strips and a lancing device isn’t exactly a big deal. That being said, I have only used this device for a week. It is a big change from using a traditional glucose meter for the last seven years, and perhaps I just needed some more time with it. 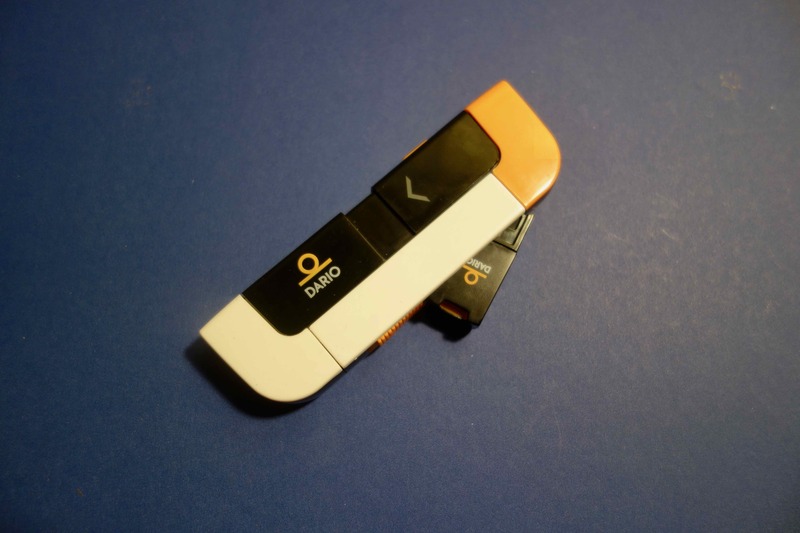 The Dario Smartphone Glucose Meter can be purchased online at mydario.net.au, and is also available through selected Pharmacies. The test strips are subsidised through the NDSS, and are sold through the Diabetes WA Shop here in Perth. Interesting, I thought the meter was self contained. Thanks for the info, I will not be going that way. I do wish them well however. I got given a Dario in August 2017. I am type 2. I have found it so much easier to use than my normal tester. It is an all in one and I can just slip it into the coin section in my purse. I find that I am more diligent about tests ng because it is always with me. Not in the medicine cabinet or the bottom of my bag. Since getting it I have been able to half my medication. I have noticed that it tests a bit higher than my Accu-Chek. I like very much that it gives me an estimate of my A1C. The other plus that I find is that I can add notes and my moods health into the app. I can also email it straight to my doctor / educator I don’t have to carry my little little g book and pen. To record everything it is all done on my phone at the push of a bottom. It is simple to remember which end is which. Orange end has lances and the white end has my strips. I did like being able to see my BGs on my smartphone app straight away, rather than having to wait until I can be bothered uploading the results to Diasend or other software. Just a warning. This device does not work with a Samsung Galaxy Note S8 which has an Otterbox Case. The case would need more holes and bigger holes. Also, if the package has been opened, you cannot return it. Out $39.99 +shipping. They’re making a killing if you can’t return it. the Dario is great but for one thing. My phone is in an Otter Box and I have to take it out ever time to test my blood. I have to test it 6 times a day which gets frustrating to say the least. If they will make the tab that goes into the phone longer I will keep my monitor. But until they do, once I have used up the strips I will be going back to my old monitor. Sorry guys bad design. You should have tested it out first.